Mu Lei's encounter with Yang Na, from the very outset, is a fairy tale. 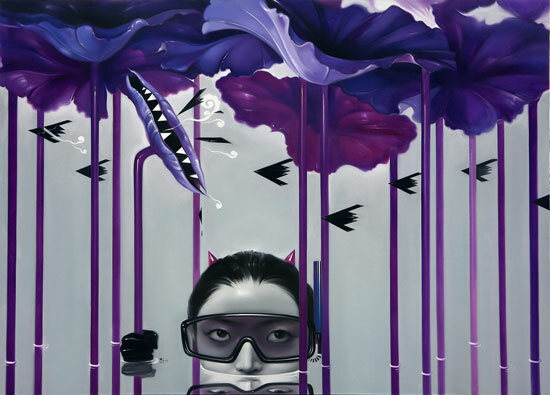 Both Yang Na and Mu Lei graduated from Sichuan Fine Arts Institute. 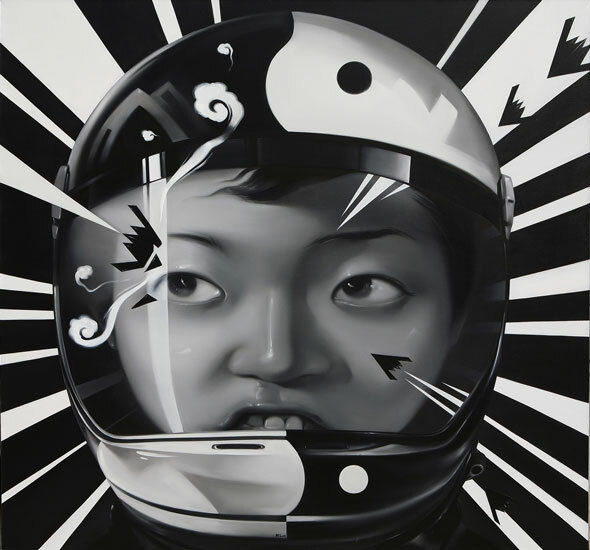 In the contemporary art circle, Yang Na is doubtless a new artist. However, her works are ardently and strenuously sought after by collectors both in China and abroad. The fairy tale of Nana has in a short time led to Yang Na’s own saga. The fairies under Mu Lei’s brush are Yang Na’s personification, while the “Nana” in Yang Na’s works is her own embodiment. Mu Lei virtualizes Yang Na’s real actions and Yang Na formalizes her own virtual self. They lock the viewers in an emotional seesaw struggle, deprive them of gravity, focus on the timeline on the canvas and then distort it, making the images timeworn and distant. The protagonist in Mu Lei’s works appears to be a cute and lively Yang Na confronting highly dangerous and destructive B2 fighter planes. The imbalance of the weak against the strong, and of one against many, signifies the physiological response the young generation of Chinese have, as exemplified by Mu Lei, in the face of encroachment by powerful foreign civilizations. 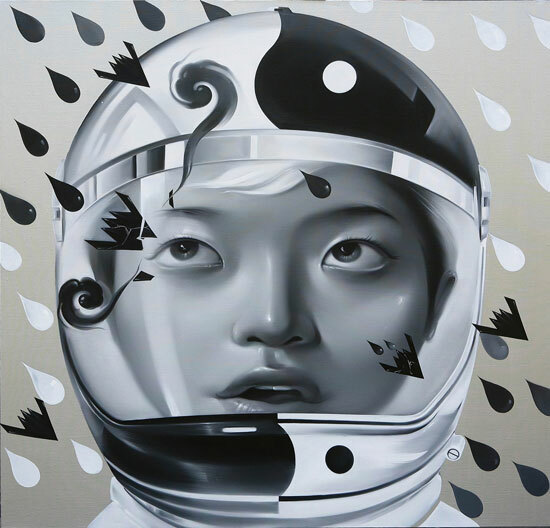 Through the addition of spiral auspicious clouds, sunglasses that de-camouflage any stealth objects, self-defense air balloons, tai ji helms, he sweetens the war, implying with supple tension that his civilization under the coercion of foreign culture can still be glamorous and inviting. 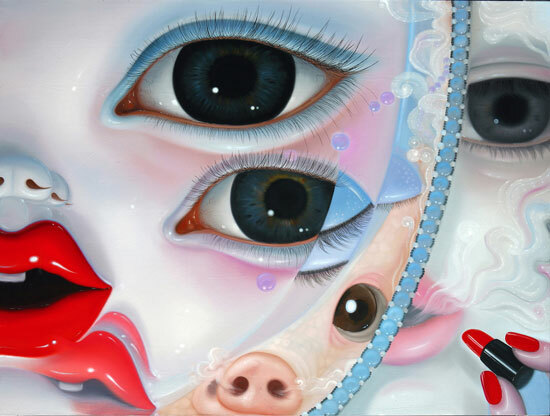 Yang Na creates an anamorphic Nana based on herself, who confronts the dazzling garish world. With a lean figure of a model and a chubby breast, Nana has an ideal shape. 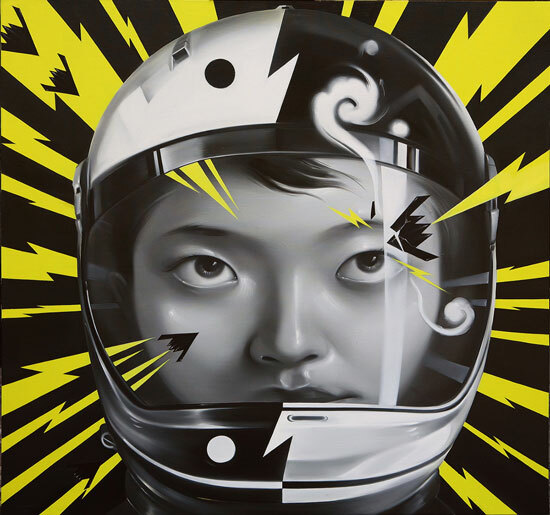 Nana’s incredible face is a prominent feature of Yang Na’s artwork. 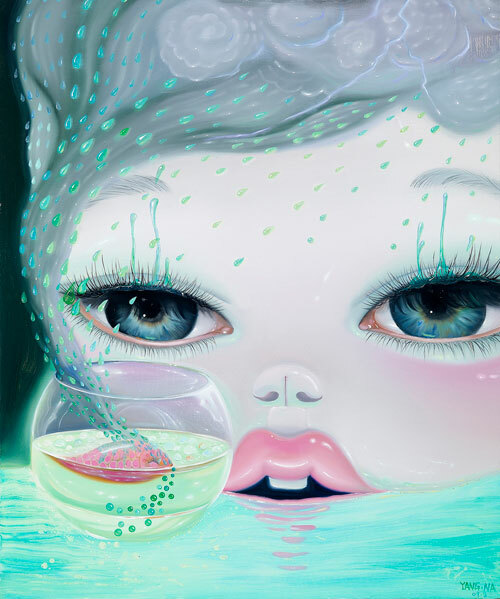 She uses the nose of her pet dog, a pair of wandering, intoxicating and enchanting eyes, an enticing amorous mouth and the trendiest makeup, to demonstrate the beauty of youth that is rife with contradiction, heterogeneity and morbidity. Often surrounded by wriggling objects in the shape of sperm, Nana appears to be childish and helpless. In the company of glittering jewels, Nana is no stranger to vanity. This young, innocent and pretentious face attracts many viewers to fall in love with the virtual iconic youth in no time. Inherently as beautiful as her works, the quiet Yang Na has a fervent desire to produce works of art, which ordinary beauties can by no means match. Like the swimming fish or sperms in her works, her calm mind always has specific objects and inscrutable profundity in store. 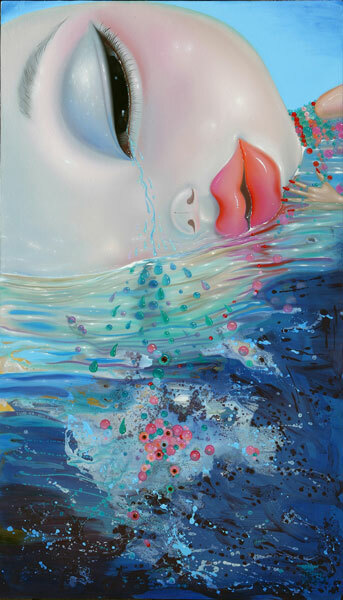 Animamix alone can hardly capture her stylistic representation. In their unpredictability, Yang Na and Nana sometimes are confusingly akin and inseparable. Her flamboyant works are brimful with complicated metaphors and designs, her pictorial language unobtrusively poignant, cunningly sarcastic and teasing. The Greek hero Ulysses drifts on the high sea. The sea is both his way home and the test bed for his bitter trials and adventures. The relation between the sea and Ulysses is a contradictory one. The relationship between the artists and their creations in reality is often one crammed with contradictions and challenges. When Mu Lei met Yang Na, they formed a partnership in the sea of contemporary art and found a reason for their sworn “Long March”. Compare these life forms with clan-based organisms and human life. The two artists’ sensitivity to and curiosity about the identity of their own culture are simultaneously their questioning and reflection of the living environment they inhabit. Although their paintings appear to be fair, mellow or even adorable, enormous tension lurks behind the tenderness and becomes their pursuit. The works of Mu Lei and Yang Na look like fairy tales, however, there are more admonitory fables inside. 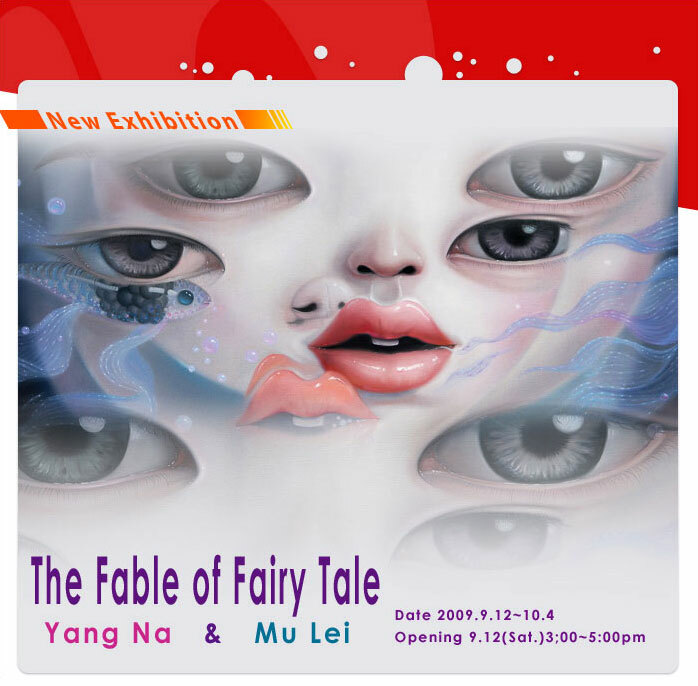 In this September with fresh air and autumn breeze, we sincerely invite you to Metaphysical Art Gallery and join us to appreciate the fable of Mu Lei and Yang Na’s fairy tale.